Years ago I heard a fascinating interview with Temple Grandin. If you haven't ever read any of her books or heard her speak, take a little time and check her out. She is an autistic woman who has incredible talents. Not only can she explain some aspects of autism in a way that everyone can understand, she also has the ability to understand how animals think and react to situations. She is truly awe-inspiring. In one of her first interviews on the radio, she talked about when she was a young girl visiting a farm and discovered "squeeze chutes." These were devices that cows would be placed in for vaccinations. The firm hold would immediately calm the animals down. She went home and created her own squeeze chute and discovered it had the same calming effect on her. Later, when they tested these on normal college students, researchers found that the students also relaxed and reported feelings of well-being. Just last year I decided would jazz up my wardrobe with a pair of boots. In Kansas, boots were just a part of my winter wardrobe, but I hadn't worn any since moving to California. It was Saturday, so the shoe store was busy and I was pretty frazzled, but I scooted some boxes out of the way, glared at the person who was walking too close to me for me to even bend down and get my sneakers off, and grumbled to myself about the general state of the shopping world. I then pulled on my first pair of knee high boots. The world seemed to slow down. The people near me seemed to fade away as I sat there, smiling, oddly calm. For the first time since entering the store I heard the overhead music. Say, was that Barry Manilow singing "Weekend in New England"? I just sat there, content and calm, placid and serene. I looked at the boots and knew I should try on others, but I was so happy with these, tight against my shapely lower legs. Then it hit me. I remembered the interview with Temple Grandin. These were squeeze chutes for my legs! Then, remembering all of Temple's work with livestock, it hit me even harder: they were squeezing my calves. I purchased them at once and even though it was still summer, I put them on when I got home and walked around in them wearing my jean shorts and ripped Grand Canyon t-shirt. I nearly went to the grocery store like this but was stopped at the door by my teenagers. Oh, and if I ever need to be vaccinated, I'll wear them then too. I've actually read some of Temple Grandin's writing for a class I took last year. It was very interesting. BTW, I LOVE LOVE LOVE your new picture in your header. Those flowers are gorgeous. I agree with eyegirl - love the new HEADER ----oh, so SPRING I can almost smell it. HOW FUNNY that we're BOTH focused on our feet - or, what we wear on our feet. Thanks for the recommendation on Temple. I've heard of her but never read her. I LOVE this concept of squeeze shoots!! How cool that you were able to establish yours! I think mine may be my nightly hot bath. Sadly, I won't be able to bring my tub with me when I get vaccinated, however! Love the header, as well!! Now I know WHY my husband walks slower when he wears his cowboy boots! Guess I'd better wear mine a little more often. Add me to the group who loves your header photo - simply gorgeous! 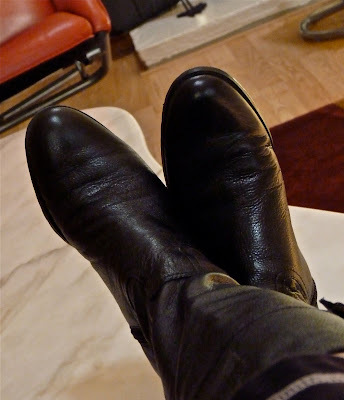 I have a pair of boots that I love as well. Though I think I like wearing them because they have extra high heels and I feel all tall and powerful. By the way there's a great movie about Temple Grandin with Claire Daines that I caught on HBO, though I'm guessing it will be available on DVD before long. I have been watching a lecture of Temple Grandin's for 30 min-- so fascinating!! Thanks for sharing this! HBO did a movie about her -- it aired last month -- but it's coming on this month again -- I have it set for the DVR! !